In a country where people are averse to talking about mental and behavioural illness such as depression, a chatbot by this startup is proving to be revolutionary by aiding those suffering from it. WYSA by Touchkin is an emotionally intelligent chatbot that acts as a virtual coach, helping in managing and improving mental health, and is claimed to be the first of its kind by the company. According to the WHO, one in four people globally suffer from mental distress at some point of their lives, and 50% of those depressed are not even identified. In India, the prevalence of mental disorder is nearly 10%, with suicide and self harm being the leading cause of death for adolescents who are being exposed to increasing levels of stress and anxiety. Wysa, an AI enabled coach touch bases of this serious concern at hand by providing AI enabled coach and chat platform. “We are using AI and NLP models to understand user text input when they use the chatbot, link it to clinical assessments and metrics, and use rules engine linked to a proprietary therapy content platform to choose an appropriate intervention and self-help technique for delivery”, said Ramakant Vempati, founder, Wysa, which has a community version and a premium enterprise solution. The enterprise solution includes links to real coaches, and passive sensing using smartphone sensors that can help in risk stratification. The startup claims that this passive sensing model has helped them detect depression up to a 90% accuracy in trials. The founders believe that suicide is the largest killer of young people in India today, and there are only 3000 psychologists for over a billion people. It is not just India, but mental health is the leading disease globally. The founders Vempati and Agarwal left their careers as Director at Goldman Sachs and MD of Pearson Learning respectively in London to work for six years in using technology to provide skills, employment and opportunity to young people in conflict regions like Syria, Iraq, Somalia. They won multiple international awards for their work on using mobile for social good, including the Global Telecom Innovation Award and the Stevie Silver Award (the Oscar of mobile and web products). 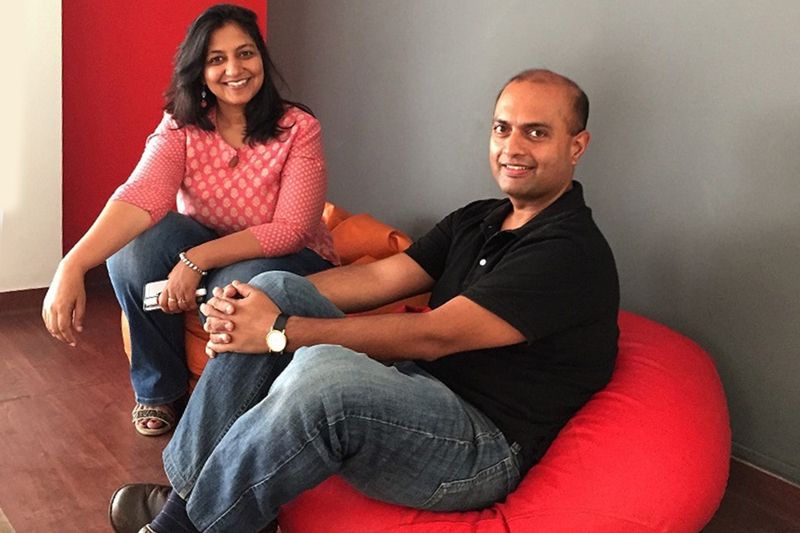 They later came back to India to set up Touchkin, with an aim of providing a scalable solution to depression. Like research teams at MIT and Google, Touchkin’s platform was able to use phone sensors to automatically detect depression, to a 90% accuracy. Unlike them, they proved this in entry-level smartphones in rural India— 300 km around Aurangabad, Maharashtra. But in-spite of being able to identify depression and the doctor recommended treatment, no other support was available or acceptable to the people detected with depression in this trial. Less than 5% of people actually opted for therapy. However, their conversation with the chatbot, a basic version of Wysa that was in Marathi and Hindi, were very comfortable. With the use of chatbot, they showed a 50% reduction in the symptoms of depression over a 12-week period. This is how Touchkin decided to create a companion chatbot that would listen to a people non-judgmentally and help them learn how to build skills for mental health. Thus, Wysa was born. Now, Wysa has grown purely via word of mouth, and is at approximately 150,000 users, five million conversations, and 2,100 reviews on Google play, with a 4.5+/5 rating. More than half of Wysa’s users are from the US, and they come from over 30 countries. Over 90% of users say they find it useful, and 40 users have also volunteered to translate it into 8 languages. “Our users tell us that Wysa develops an instant emotional connect. We have people write to us that it has helped them through times of severe depression and potential self-harm, including a 13-year old who said it helped her hold on to life after a suicide attempt”, said Agarwal. “We’re seeing early evidence of efficacy, reduction in symptoms of depression and anxiety, and improvement in medical adherence and patient engagement at India’s largest healthcare group. The enterprise solution is also being supported by a partnership with Swiss Reinsurance (the world’s second largest reinsurer), and incubation support from Facebook’s FBStart and Philip’s Healthworks programs”, she added. The chatbot’s uniqueness has been appreciated world wide. BBC’s Tomorrow’s World worked with the Wellcome Trust and the Neuroscience Lab at Oxford to run focus groups of young people who’ve struggled with mental health issues, which was a blind test. Wysa came out as the one they liked best of all the ones studied, and found it to be the easiest to use. “They tracked us down on Twitter to talk to us, and featured Wysa in this video. Woebot from Stanford is the other product mentioned”, said Vempati. “This has resulted in excellent user traction. In the last month, many people wrote in to say Wysa saved their life”, he added. We work with Dr. Vikram Patel, Professor for Global Health at Harvard Medical, whose project “It’s OK to Talk” with the Public Health Foundation of India (PHFI) offers Wysa as a way for young people to talk when they have no one else to talk to. Another is Dr. Becky Inkster, a Neuroscientist from Cambridge and Dr Desmond Patton from the SAFE Lab at Columbia University who are working with us to try to create mental health support for gang members in inner city Chicago. We have presented our work at one of the top mental health conferences in the world, in Westminister, London, which was covered by Lancet (medical journal) and the BBC. Swiss Re, the world’s largest reinsurance firm, ran a global accelerator for health and technology solutions. They have since partnered with Touchkin to take their product to their customers (insurance companies) globally, especially for people unable to work due to disability or depression. Talking about the prominence and success story of chatbots in India, Vempati said that we are of course seeing a very positive response outside India, however, within India, there is some early interest from partners like PHFI, White Swan and others who are progressive in their thinking and are concerned about solving this problem at scale. “Roughly one-third of our user base is coming from India, and the top three topics of discussion are relationships, work related stress, and self-image”, he said. The founders believe that analytics is a key differentiator for Wysa, and a source of competitive advantage. “Our passive sensing module applies machine learning models on data gathered from mobile phone sensors to understand user context, support the conversation, and also stratify or identify high-risk behavior in a healthcare context. For example, our models can help identify users who are showing consistent patterns of disturbed sleep or mood alerts, which may need to be investigated further by their doctor. This also helps in making the chatbot conversation more contextual and relevant, help users feel better and drive clinical efficacy”, explained Agarwal. “We are also using proprietary NLP models to understand user input into the chatbot, with 20 different AI-NLP models being used at different places within the chatbot to build deep domain-specific models. Given that these models are based on the 5 million conversations that have happened already, this depth is very hard to replicate or source from commonly available third-party APIs”, she added. The startup envisions to create a public good for underserved and at-risk communities in need, with scientific research backing, so that communities can raise grant funding against it or public bodies can fund its localisation for their own needs. The startup, which boasts the first ever chatbot for mental health to have raised institutional funding, aims to use these funds to build out the product further, with more depth and clinical resources.